Jane Timken, chairman of the Ohio Republican Party expresses her appreciation to all those attending the 2019 Auglaize & Shelby County Republican Party Joint Lincoln Day Dinner held Wednesday at Shelby Oaks in Sidney, Ohio. SIDNEY — “Every vote counts, from the township building to the White House. 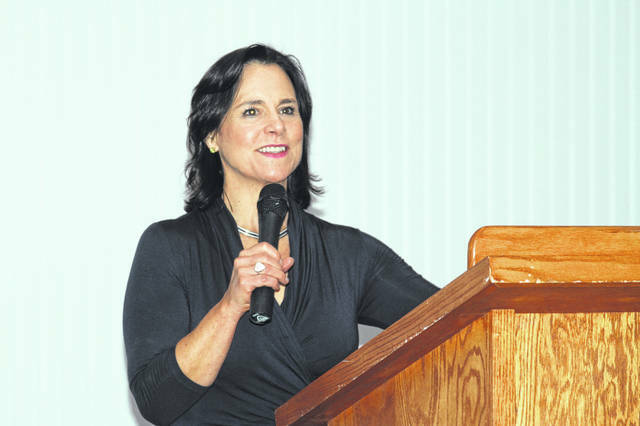 We live in the best country in the world, we must preserve our U.S. Constitution and Bill of Rights to stay on top, our future and the future of the rest of the world depends upon it,” Ohio Republican Chairman Jane Timken told the more than 150 in attendance for Wednesday, April 10, Lincoln Day Dinner hosted by Shelby and Auglaize County Republican parties. The event was held at Shelby Oaks. Elected officials in the Republican Party from both Auglaize and Shelby County and a host of their supporters gathered for a dinner and to hear Timken talk about the GOP and its future. Born in Cincinnati, Ohio, Timken is no stranger to the political arena and spoke with confidence and excitement about the new positive and prosperous direction the United States has taken since the election of President Donald J. Trump. Timken came to the annual Republican dinner to reassure local Republicans they are not overlooked on the state and national level; that their efforts are appreciated, and encouraged all in attendance to rally in support of local Republican candidates in future elections “For the sake of our U.S. Constitution, and for the sake of our country and future generations,” said Timken. Timken was elected chairman of the Ohio Republican Party on Jan. 6, 2017. She previously served as vice chairman of the Stark County Republican Party, where she was responsible for fundraising efforts, candidate recruitment, volunteer engagement, campaign logistics, and implementation of strategy. She began her stellar legal career specializing in civil litigation, employment law, workers compensation, and medical malpractice defense practicing law in several law offices in Ohio and in Washington, D.C. She has served on numerous boards related to everything from academics to the arts; including legal counselling and education in and outside the state of Ohio where she endeavored to improve the quality, access, and efficiency in higher education. She graduated with honors from Harvard College, and the Washington College of Law in Washington D.C. and is also licensed to practice law in the state of Ohio. She currently resides in Stark County with her husband and two children. Timken was quizzed about her reason for coming to Shelby County and she responded without hesitation. “I want to make sure the Republicans living and working here know they are appreciated,” said Timken. “We’re all in this together and share common goals. We must continue making improvements locally and nationwide to turn things around. After eight years of going in the wrong direction, the previous presidential administration left President Trump and all the rest of us with a lot of work to do. “The past administrations in Washington D.C., and in Columbus caused a lot of division and many Ohio Republicans in all 88 counties became disconnected from the state level,” she said. “A lot of people became confused about the direction they were heading and began to doubt their influence at the state level. I’m here to assure everyone things are back on track, their voices are being heard, and their efforts do make a big difference. ”President Trump awoke a sleeping giant in this country, one that isn’t going to go away, and he isn’t going away either! Voters in the U.S. are wising up and demanding accountability. President Trump has a ‘U.S. First’ attitude and so should all of us; we all share a ‘partnership in leadership’ and must remain unified if we’re going to stand against those working so hard to tear our country down,” Timken said. The meeting was called to order by Auglaize County Republican Party Chairman John Bergman, who welcomed and thanked everyone for coming followed by the Pledge of Allegiance to the American Flag led by local Republican Youth leader Gavin Sutton, and a prayer offered by Sharon L. Kennedy 154th Justice of the Supreme Court. Dinner then was served by the Spot Restaurant & Catering. After dinner, Aaron Heilers, Shelby County Republican Party chairman, again thanked those in attendance for coming and welcomed Timken to the podium where she too expressed her gratitude for a big crowd. “Wow, thank you all for coming, it’s very heartwarming and uplifting to see you all here; your dedication and loyalty to Shelby County, the state of Ohio and the United States of America is appreciated more than you can possible know,” said Timken “I came here to tell you things are looking up again in Ohio after the election of Gov. Mike DeWine. He and his staff are doing a great job, but have a lot of work and catching up to do. “I am so thankful to have so many great people to work with, here and on the state and national level. I promise we will keep trying our best and work very hard for Ohioans and the American people; we’re putting in a lot of very long days but it’s worth it,” she said. “Though some elected officials have let us down from time to time in the past, I have a lot of confidence in many who hold office today. I thank God for Jim Jordan and his tireless attitude, he is a fighter and it’s hard to imagine how he gets so much done, but he does. We’ve maintained a strong position in the Ohio House and Senate and everyone laboring there is excited and working hard to reestablish the strong connection with the voters that once existed there. “Along those lines, I am privileged and pleased to announce that today, after ten years of fighting for it, the Ohio legislature has passed the ‘heartbeat bill’ and it now goes to Governor Mike DeWine for his signature. Gov. DeWine had previously vowed to sign the bill during his last campaign, this victory illustrates that although it sometimes takes time, even years, change for the better is possible.” Timken said. After that comment, a rousing round of cheers and applause erupted in the banquet room that lasted for quite some time. Timken acknowledged the level of excitement shared in the room but quickly reminded everyone that just because there was a victory realized it’s not time to let down your guard. “We must push on as our opposition is relentless as well, there were a lot of people at the State House cheering for something as evil as late term abortion today and we can’t forget people like AOC (D-Rep. Alexandria Ocasio-Cortez) and a lot of others who are totally out of touch with reality; there is no depth to their depravity and they are focused on their own priorities and political agendas, not those of the American people or the timeless values found in the U.S. Constitution which has served us so well for so long,” Timken said. After speaking Timken turned the microphone over to three Ohio Republican representatives for comments. Nino Vitale from the 85th District, Craig Riedel from the 82nd District and Susan Manchester from the 84th District all shared their gratitude, sentiments, and concerns about current issues and the coming election in 2020 and the importance of getting the word out and encouraging others to vote for the Republican ticket. All three acknowledged appreciation for the passage of the heartbeat bill each taking turn to express their heartfelt feelings on the issue of abortion. “There were over 21,000 abortions in Ohio last year, that’s 21,000-plus too many, this bill will save a lot of lives,” said Vitale. Riedel was also very vocal recanting the series of events earlier in the afternoon, what transpired, and the unforgettable opposition to the heartbeat bill by protestors. Manchester said she saw members of the Democratic Congress literally crying because a bill was passed to save the lives of un-born children. “I just don’t get it, what kind of a person does that kind of thing, I mean who in their right mind would cheer for the death of a child or cry when so many lives are saved?” said Manchester. Before closing the meeting, numbers were drawn for a gift card raffle and closing remarks made by Heilers encouraging those in attendance to stay the course, and keep the faith. The writer is a regular contributor to the Sidney Daily News.